So do you love wine tastings? Do you love choosing wines to pair with your favorite foods? Do you love reading about wine? Maybe, like me, you even love writing about wine? But despite your devotion to wine, the beauty of loving wine is that there is always more to learn. With the countless wine regions in the world and their ever-changing wines, the world of wine is continually open for new explorations. Recently I visited the place I want to go to learn more about wine and perhaps you will too. 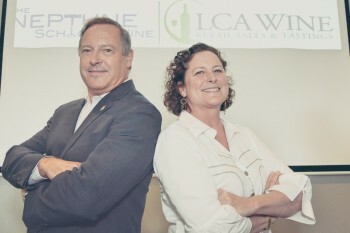 LCA Wine focuses on wine tasting, wine education and retail wine sales. LCA Wine continues a tradition started in Laguna Beach (when it was Laguna Culinary Arts) more than ten years ago. 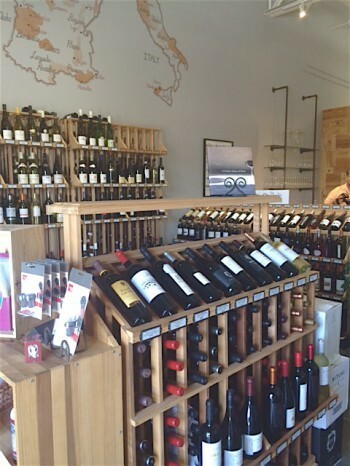 In its opened shop and tasting room in Costa Mesa, LCA Wine offers wines from all over the world that represent a wide variety of unique terriors. LCA Wine was founded by Nancy Milby who holds a diploma in Wine & Spirits from the Wine & Spirits Education Trust (WSET) of London and is a certified instructor for the WSET and the French Wine Scholar Program. She is also a Certified Sommelier from the Court of Master Sommeliers. She has many other impressive certifications and recognitions. The Neptune School of Wine, which operates in space adjacent to LCA, was founded by Peter Neptune who is one of only 122 people in North America to achieve the prestigious title of Master Sommelier. Peter also holds the title of Certified Wine Educator with the Society of Wine Educators and has many other notable designations. In particular, he offers certification classes for the Wine & Spirts Education Trust (WSET), The French Wine Scholar Program, and the Society of Wine Educators. He teaches advanced classes at various levels. LCA and Neptune offer classes for those at all levels of wine experience from beginning to advanced. Many people who take their more advanced classes are already employed or looking for employment in the wine industry and need further training and certifications that will enhance their careers. Nancy and Peter have inspiring stories about many of their past students who had little or no wine experience but who are now happily employed in the wine industry, whether it be in retail fields or within a winery or production venue. We were fortunate that both Nancy and Peter hosted the informative and entertaining wine tasting we recently experienced at LCA. Through this tasting, we learned about how they approach wines and they helped us in evaluating wines differently than we might have done in the past. We learned that wine education is not about liking or not liking certain wines but about learning to detect the actual characteristics of a particular wine, especially as it relates to the wine’s “typicity.” This means, for instance, if you are drinking a Chardonnay, does it have the color, aroma and characteristic tastes that we would normally expect from a Chardonnay? If so, then this wine is true to typicity. We tasted seven wines and evaluated each wine’s appearance, nose and taste on the palate. We asked many questions about each wine. Was the wine clear or cloudy? What was its color—lemon, gold, pink, ruby or any of a wide range of shades? On first sniff, was its aroma fruity, floral, spicy, oaky or did it have some other distinctive bouquet? Then when we tasted the wine, we determined if it had low or high levels of sweetness or acidity. Was it full-bodied and balanced? What flavors did we detect—fruit, floral, spice, oak, or earthy (and the possible tastes are almost endless)? What level of tannins or kind of finish (short, medium or long) did this wine have? These are just a few of the countless characteristics we tried to identify in these wines. Only after going through these steps, expertly guided by Nancy and Peter, were we able to fully describe and evaluate the wines. I will just describe three of the wines we tasted. 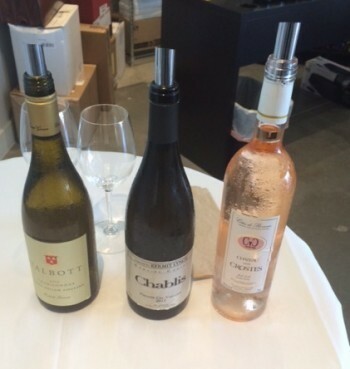 My favorite was the Chateau les Crostes Rose 2013, from Cotes de Provence in France. I was entranced by its pale, peach color before even tasting the wine. Its nose of mixed greens led to slightly spicy, orange peel tastes. I could imagine this wine enhancing a lovely salmon or even sushi dish. Priced at only $21, this wine is a great buy for the quality—and so I purchased two bottles. I also particularly enjoyed the Cardwell Hills 2011 Pinot Noir from Willamette Valley, Oregon. Its bright red cherry color was so inviting, as was its earthy nose. I actually smelled barnyard on the palate and I liked it. (Barnyard can mean appealing scents like freshly cut hay or green grass or deep, rich earth.) I could imagine sipping this wine with a savory lamb shank or pork roast. Again, at $23.25 this is a good buy. Another really delicious wine was the Ogier ‘Les Temp Est Venu 2011 Cotes du Rhone from France’s Southern Rhone Valley. Distinctively lavender and sage on the nose, the tastes were lusciously herbal with hints of cherries, sage and spring flowers. At $21, this wine is nicely priced for the quality. Throughout the process of tasting these wines, Nancy and Peter guided us through the process. The result was a much greater appreciation of the wines. I can understand why their classes are so enlightening to so many. Go to their websites to find out more about the kinds, levels, schedules and prices of classes being offered: LCA Wine and Neptune School of Wine. While perusing the LCA tasting room, I was pleased to see that there were more than 400 high quality and mostly reasonably priced wines from around the world—all carefully chosen by Nancy and many I had not seen available anywhere else in the area. LCA also offers wine tastings, hosts private wine tastings, and sponsors specialty wine seminars. All this can be found on the LCA website. LCA Wine is located at 3315 Hyland Ave., Costa Mesa. General store hours are 11 a.m. to 6 p.m. Tuesday through Friday, and Saturdays from 10 a.m. to 6 p.m. Call 657-232-0920 for more information.